My name is Amy and I'm a 24 year old literature graduate. I started this blog because I needed somewhere to put all of my lit-related feelings now I don't have any essays left to write. I mostly review books that I have bought, or would otherwise have done so. I read books I think I will like, so if my reviews are positive it is likely because I do choose books I think I'll enjoy. I am quite critical, however, and try not to be biased. Feel free to have a look around, please follow the blog as I'll be updating with reviews as often as I can, and I'd love it if we could connect on social media! Would You Rather… Books or more books? 1. Read only trilogies or stand-alones? I’ve read some pretty great trilogies in my time, but also some not-so-great trilogies and series. The amount of quality stand-alone novels by far outweigh any trilogy, so I’m going to have to say stand-alone. 2. Read only female or male authors? It doesn’t really make much of a difference to me, but if I had to choose I’d pick women writers, because they tend (not exclusively) to write stronger/more female characters, and that’s always a quality I love in a book. 3. Shop at Barnes & Noble or Amazon? We don’t have Barnes & Noble here, but I’m going to swap it out for Waterstones. If I can afford it, I always buy from bookshops, preferably independent ones (like my wonderful life-long indie bookshop back home). I know that Amazon can be cheaper, and if you can’t get out to a shop you can always order it with next-day delivery (I used to have Prime. It was pretty swish.) and that’s helpful, but not worth it. And it means you end up missing out on loads of lovely books you might not have seen if you’re just clicking around the internet! 4. All books become movies or t.v. shows? 5. Read 5 pages per day or 5 books per week? Five books a week! Although reading five pages per day of a book might be interesting. I might try that some time (while reading other books quickly, of course). 6. Be a professional reviewer or author? Author. Without a doubt. I’ve always been a writer, and one day I might pursue getting published. For now I’m happy being a reviewer, though. 7. Only read your top 20 favourite books over and over or always read new ones that you haven’t read before? Always read new ones. I’ve re-read so many books and enjoyed them every time, but if they were the only ones I could read, I doubt they’d stay favourites for long. 8. Be a librarian or book seller? 9. Only read your favourite genre, or every genre except your favourite? Every genre except my favourite. I think if you only read your favourite genre you’d quickly get to the lesser-quality titles. With every other genre at least you have variety and can choose more quality books. Physical books. I’m always a physical-book lover and will generally only read eBooks if it’s my only choice for that book (review copies, etc.). I can’t deny that they’re pretty handy, but there’s nothing like the feeling of a good book in your hands. This tag was created by RayKaybooks – here is the link to the original video, but I found it on Bookishrebel‘s blog. I tag anybody who feels like doing this! 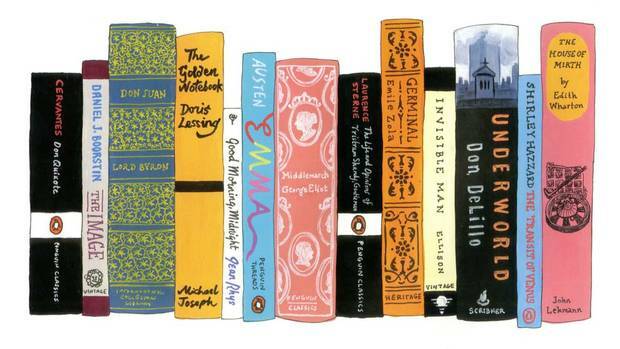 Image: Jennifer Egan’s bookshelf from My Ideal Bookshelf as illustrated by Jane Mount.